The Global Volcanism Program has no activity reports for Craters of the Moon. The Global Volcanism Program has no Weekly Reports available for Craters of the Moon. The Global Volcanism Program has no Bulletin Reports available for Craters of the Moon. Craters of the Moon, the largest lava field of the Snake River Plain (SRP), covers about 1600 km2 with more than 60 mapped lava flows erupted from eight fissure systems. 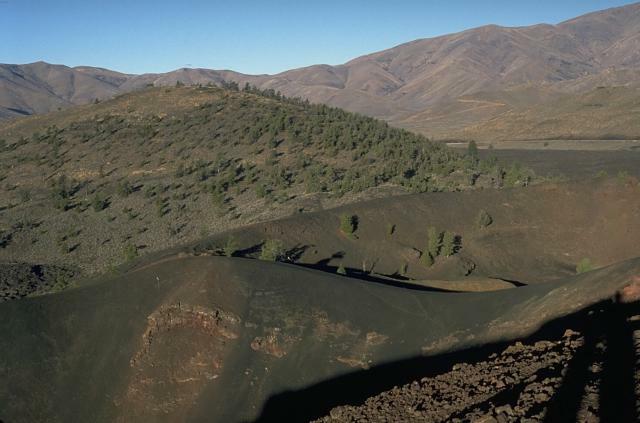 About 25 cinder cones up to 250 m high formed primarily along a 45-km-long segment of the Great Rift, the principal 2-8 km wide fissure system that trends NW-SE through Craters of the Moon National Monument. 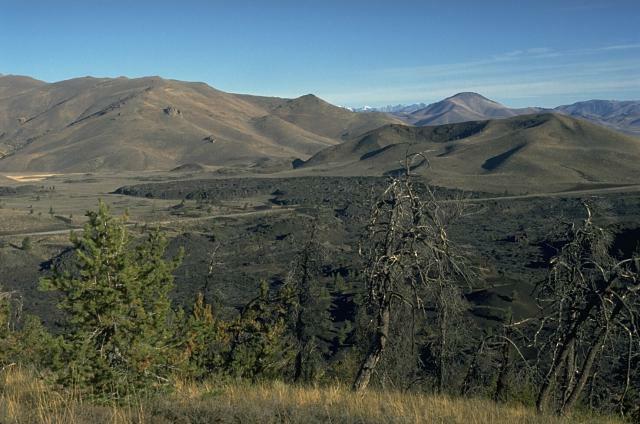 Craters of the Moon lies at the NW part of the Eastern Snake River Plain, and the northern part of the field laps up against the White Knob and Pioneer Mountains. The lava field was formed during eight eruptive episodes between about 15,000 and 2000 years ago separated by quiescent periods up to about 3000 years in duration. This contrasts with other SRP lava fields, which were formed during single eruptive episodes of relatively short duration. A complex assemblage of basaltic volcanic features is found at Craters of the Moon, and cinder cones are common. Greeley R, King J S (eds), 1977. Volcanism of the eastern Snake River Plain, Idaho: a comparative planetary geology guidebook. NASA (Washington, DC), CR-154621: 1-308. Hughes S S, Smith R P, Hackett W R, Anderson S R, 1999. Mafic volcanism and environmental geology of the eastern Snake River Plain. In: Hughes S S, Thackray G D (eds), Guidebook to the Geology of eastern Idaho, Pocatello, Idaho: Idaho Musuem of Nat Hist, p 143-168. Hughes S S, Smith R P, Hackett W R, McCurry M, Anderson S R, Ferdock G C, 1997. Bimodal magmatism, basaltic volcanic styles, tectonics, and geomorphic processes of the eastern Snake River Plain, Idaho. Brigham Young Univ Geol Studies, 42: 423-458. Kuntz M A, Champion D E, Lefebvre R H, Covington H R, 1988. Geologic map of the Craters of the Moon, Kings Bowl, and Wapi lava fields and the Great Rift volcanic rift zone, south-central Idaho. U S Geol Surv Misc Invest Ser Map, I:1632, 1:100,000 scale geol map. Kuntz M A, Champion D E, Spiker E C, Lefebvre R H, McBroome L A, 1982. The Great Rift and the evolution of the Craters of the Moon lava field, Idaho. In: Bonnichsen B, Breckenridge R M (eds), The Great Rift and the Evolution of the Craters of the Moon Lava Field, Idaho, Idaho Bur Mines Geol Bull, 26: 423-437. Kuntz M A, Covington H R, Schorr L J, 1992. An overview of basaltic volcanism of the eastern Snake River Plain. In: Link P K, Kuntz M A, Platt L B (eds), Regional Geology of Eastern Idaho and Western Wyoming, Geol Soc Amer Mem, 179: 227-267. Prinz M, 1970. Idaho rift system, Snake River Plain, Idaho. Geol Soc Amer Bull, 81: 941-948. Stearns H T, Crandall L, Steward W G, 1938. Geology and ground-water resources of the Snake River Plain in southeastern Idaho. U S Geol Surv Water Supply Pap, 774: 1-268. There is no Deformation History data available for Craters of the Moon. There is no Emissions History data available for Craters of the Moon. The Highway lava flow forming the black lobe in the center of the photo at the base of the Pioneer Mountains was erupted about 2300 years ago from a vent at or near North Crater, out of view to the right. Two other Craters of the Moon flows, the Devils Orchard and Serrate lava flows, were also erupted at about the same time. The complex vegetated cinder cone to the right of the Highway lava flow is the late Pleistocene Sunset Cone. The Blue Dragon lava flow covers about 280 sq km of Craters of the Moon lava field with flat-lying pahoehoe lava. The 3.4 cu km flow, erupted about 2075 years ago, is the largest in the Craters of the Moon volcanic field. It traveled up to 25 km to the east and 15 km to the SW from fissure vents near the center of this photo. The largely pahoehoe lava flow is named for a characteristic iridescent dark- to light-blue, glassy crust. Photo by Lee Siebert. 1994 (Smithsonian Institution). 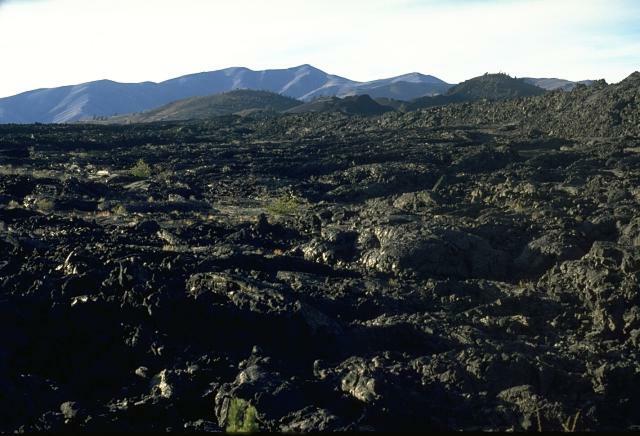 The ropy surface of pahoehoe lava flows is the dominant lava type at Craters of the Moon. 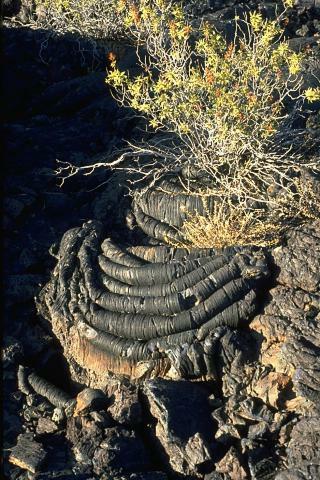 The pahoehoe flows were typically erupted through lava tubes and tube systems. Locally collapse of tube roofs has formed skylights and entrances to lava tunnels that are popular among visitors to the national monument. 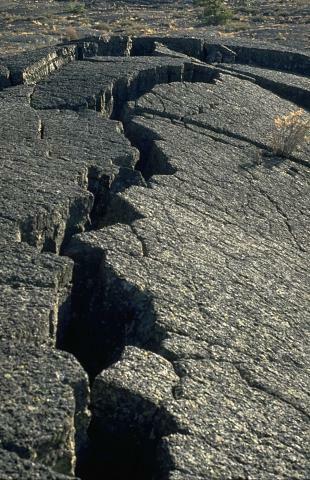 Pressure ridges, formed when moving, still-fluid magma buckled the solidified surfaces of pahoehoe lava flows, are one of the many lava flow features easily observed at Craters of the Moon National Monument in Idaho. 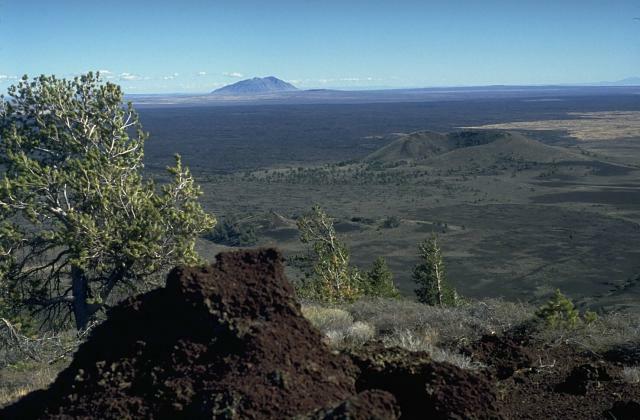 Silent Cone, the partially forested cinder cone in the background, was the source of lava flows primarily to the south about 6500 years ago. 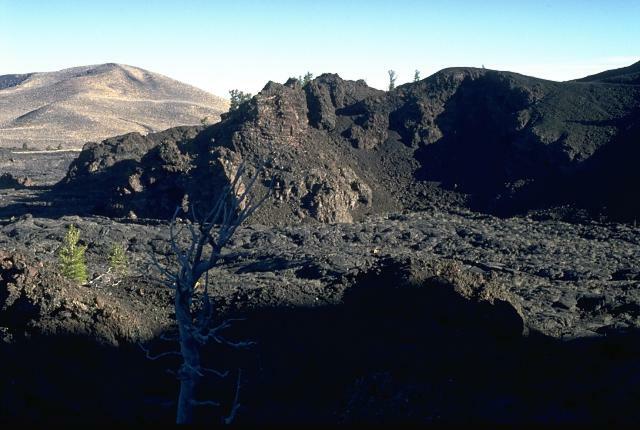 The well-preserved cone of Big Craters in the foreground is one of the youngest features of Craters of the Moon. The Big Craters lava flow in the foreground, one of the youngest at the Craters of the Moon, originated about 2200 years ago from vents at the northern base of Big Craters. The flows traveled north before being deflected by the slopes of the Pioneer Mountains in the background and then flowed primarily to the SW. The vast extent of the Blue Dragon lava flow, forming the flat area in the middle of the photo, can be appreciated in this view from Big Cinder Butte with Big Southern Butte in the background to the east. The Blue Dragon flow, the largest volume lava flow at Craters of the Moon, covers 280 sq km with 3.4 cu km of lava. The flow was erupted about 2075 years ago and covers broad areas as far as 25 km to the east and 15 km to the SW of its vent area. The Craters of the Moon lava field covers 1600 sq km of the Snake River Plain with lava flows erupted from NW-SE-trending fissures and cinder cones. 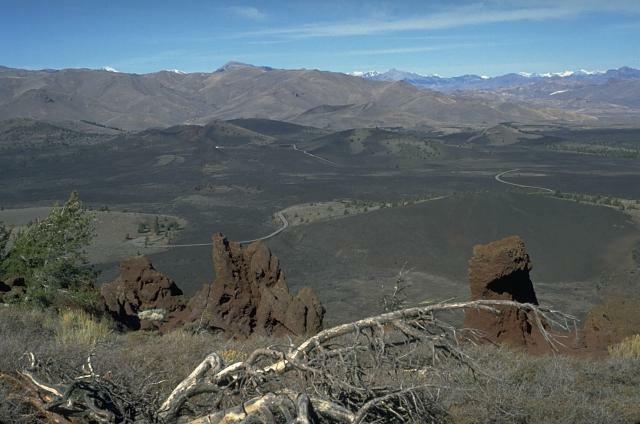 The northern part of the lava field, seen from Big Cinder Butte with the Pioneer Mountains in the background to the north, contains many flows and cinder cones formed during the most recent eruptions about 2300 to 2100 years ago. There are no samples for Craters of the Moon in the Smithsonian's NMNH Department of Mineral Sciences Rock and Ore collection. Large Eruptions of Craters of the Moon Information about large Quaternary eruptions (VEI >= 4) is cataloged in the Large Magnitude Explosive Volcanic Eruptions (LaMEVE) database of the Volcano Global Risk Identification and Analysis Project (VOGRIPA).